John Anderson AO is an Australian politician whose distinguished political career spanned nearly two decades. He served as a Member of Parliament (Gwydir) from 1989 to 2007 and as the 11th Deputy Prime Minister from 1999 to 2005. He also held the position of the 10th Leader of the National Party of Australia during his time as Deputy PM. 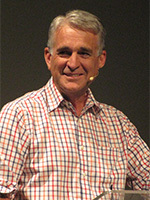 In 2005 he announced his retirement and resigned from his positions as Deputy PM and the National Party leader, but remained on as MP in the House of Representatives until his retirement in 2007. John was honoured in 2011 as the recipient of Officer of the Order of Australia for distinguished service during his political career and his contribution to the rural communities in Australia, as well as his support for transportation development and water management. He continues to dedicate his time promoting and serving the interests of Australia’s rural and regional communities. He is currently the Chair of the Australian Government’s INLAND RAIL Implementation Group, a multimillion dollar Brisbane to Melbourne rail project.